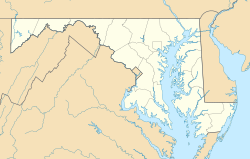 Williston is an unincorporated town and census-designated place on the Eastern Shore of the U.S. state of Maryland, in Caroline County. As of the 2010 census it had a population of 155. It is situated between Maryland Route 16 on its eastern edge and the Choptank River on its west. It was originally known as Potter's Landing for its first resident, Zabdiel Potter. His home, Potter Hall, was listed on the National Register of Historic Places in 1982. The Caroline Country Club is located just north of Williston, and the Caroline-Dorchester County Fair is held annually just east of town. ^ "Geographic Identifiers: 2010 Demographic Profile Data (G001): Williston CDP, Maryland". U.S. Census Bureau, American Factfinder. Retrieved August 22, 2014. This article about a location in Caroline County Maryland is a stub. You can help Wikipedia by expanding it. This page was last edited on 20 September 2018, at 04:20 (UTC).